Do you ever wonder where you fit in? Do you sometimes get that feeling that you have something much bigger to offer the universe, but then it fills you with fear and anxiety, so you think maybe I’ll just pay it safe? But what is safe? The factory job? The cubicle job? Factories all over have been converted to open spaces for startups. Skyscrapers have entire floors open for lease because the “same as everyone else” class of jobs have dried up. Many of us were raised to seek out a job that required us to fit in, to conform, to adapt until we fit the mold. 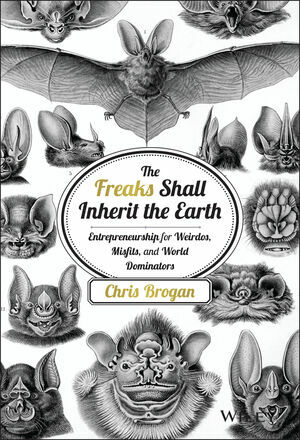 The Freaks Shall Inherit The Earth is a guide for the kind of person who wouldn’t normally pick up a business book. Take the plunge. Learn to fail and then win. Dare to do something that “everyone else” doesn’t. The Freaks Shall Inherit the Earth will help. Bestselling author and successful entrepreneur Chris Brogan explains step-by-step how to build your business from the ground up, all without compromising the unique mindset and personal values that make you a freak in the first place. Chris Brogan is Publisher and CEO of Owner Magazine, a business magazine helping you improve your worth by growing your capabilities and connections. He is a sought-after keynote speaker who has addressed crowds of thousands, been on the Dr. Phil show, and once presented to a princess. Chris has consulted with companies you know like Disney, Microsoft, Coke, Titleist, Pepsico, Google, Motorola, and many more.